PYEONGCHANG, South Korea, Feb. 1 (Yonhap) — Lee Hee-beom, the chief organizer for the 2018 PyeongChang Winter Olympics, called for “emergency measures” to boost ticket sales for the quadrennial event on Thursday. With only eight days left to the first Winter Olympics in South Korea, Lee said his team will try its best to increase ticket sales, especially for the more expensive ones. The local organizers said 799,000 tickets, or 74.8 percent of the available 1.07 million tickets, have been sold as of Wednesday. Some tickets for the Olympic events cost more than 1 million won (US$930). For instance, the most expensive seat for the opening ceremony is priced at 1.5 million won. Lee said he reported to International Olympic Committee (IOC) President Thomas Bach that the ticket sales will go up as the Olympics gets under way. 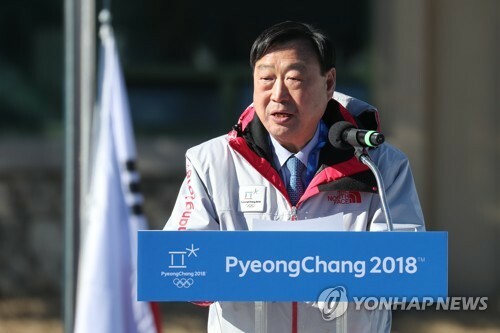 Lee said that with the opening of the villages and competition venues, he thinks the PyeongChang Olympics have already begun.